Let’s round out the week with a Wheaten devil. Oh me. I just love this one. That poor little Wheatie. I just know he’s not a devil in real life. Friday’s are Fun Foto Days. So send me YOUR foto and the peep and I will have fun with it and post it here one Friday. Sound like fun? ArrrOOOOO it does. 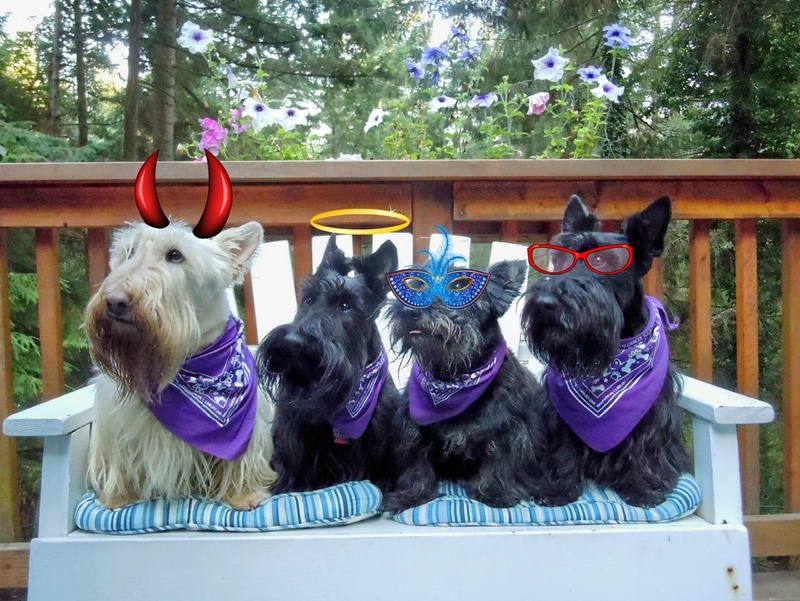 This entry was posted in The Scottie Chronicles and tagged animals, dogs, fun photos, photograpy, Scotties. Bookmark the permalink. I can’t imagine a Scottie devil. When Kali first cam here in January of last year, She thought Kali was a devil. No way. Kali is now a sweetheart. Only one of the five wheaties was missing the devil gene. That was Tory. He was the sweetest and most beautiful Scottie that ever walked the planet. What a great photo! The ‘Purple Bandana Bunch’ are spoofin’ us today with their accessories! I’m sticking to my thought that Wheaten Scottish Terriers look bigger. Hehehe, I like his style!! Who are all dos good looking scots?